Estudio ODS is a space to develop ideas in the areas of architecture, design and urbanism that allies a rigorous conception with critical methodologies and forms of reflection. 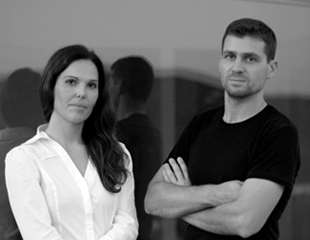 Founded in 2010 by the architects Marlene dos Santos e Bruno Oliveira, a young and highly motivated team that collaborates with different experts and authors from various fields to enrich and extend the scope of their multidisciplinary work. Both have a Master degree in Proyectos Arquitectónicos Avanzados from ETSAM, Escuela Técnica Superior de Arquitectura de Madrid (2011), are architecture graduates from the School of Arts at the University of Évora (2006) and participated in the Erasmus program in ETSAV, Escuela Tecnica Superior de Arquitectura de Valencia in 2005. Collaborated with Atelier Bugio - João Favila in Lisbon from 2007 to 2010 and with the Architecture Office MGM, Morales+Giles+Mariscal, in Seville between 2006 and 2007 with the Leonardo da Vinci scholarship. Their work has been referenced in national and international publications, and exhibited in Lisbon, Santiago de Compostela, Madrid and Berlin. Achieved prizes of reference in national and international competitions of ideas, including the 1st prize in the international competition Europan 9 in Spain in the site Poio, the 1st prize in the international competition Europan 12 in Vila Viçosa and the 3rd prize in the international competition Europan 13 in Selb, Germany. 2016 . Lecture for Europan 13 PT . Sociedade Recreativa São Teotonio, Odemira. September 9th. 2016 . Lecture in "Young Architects Day". Universidade de Èvora, Departamento de Arquitectura, Èvora. May 6th. 2015 . Lecture with the theme "A arquitectura na Paisagem". Universidade do Algarve, Campus de Gambelas, Faro. March 6th. 2014 . Lecture for Europan 12 Inter-sesions Forum . Implementation project process Europan 9 in Poio, Pontevedra. Pavia - Itália, September 26th. 2014. Lecture for Europan 12 - Portugal. Wining teams in the 12nd edition of Europan Portugal. Faculdade de Ciências e Tecnologia, Campus da Caparica, Almada. May 13th. 2014 . Paper JORNAL DO ALGARVE, nº2981, Vila Real de Stº António, 15 de Maio 2014, pp.17 (artes e letras). 2008 . Catalogue dos resultados do concurso para a Futura Sede da Junta de Freguesia de Portimão. 2008 . Magazine ARQ./A, Arquitectura e Arte, n.º 55, Futurmagazine, Lisboa, pp. 14 (news - actualidades). 2008 . Exhibition “Europan 9 - España” - Colégio Oficial de Arquitectos de Zaragoza, Espanha. 2008. Exhibition “Nova Sede da Junta de Freguesia de Portimão” - Salão Nobre da Junta de Freguesia de Portimão, Portugal (27 Junho - 11 de Julho 2008).